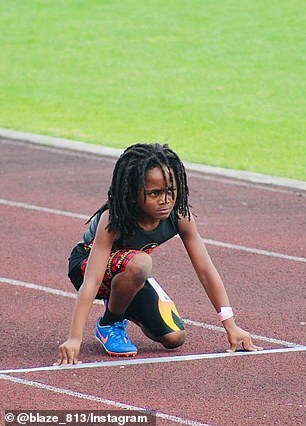 Little Rudolph 'Blaze' Ingram is 1.5 seconds closer to following in the footsteps of Usain Bolt as the fastest man on earth and he's only seven years old. 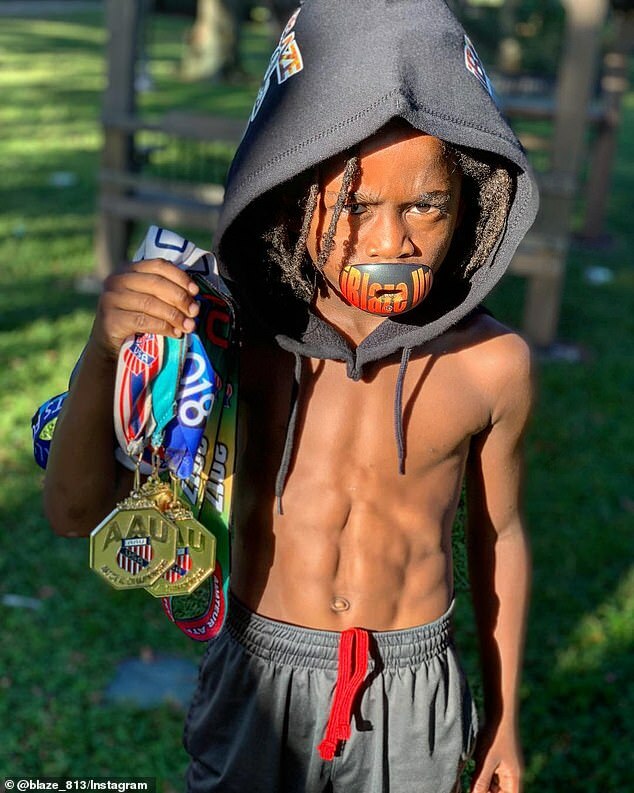 In a new clip posted on the Florida boy's Instagram page Sunday, the youngster shows he has improved since his staggering feat of completing a 100-meter race in 14.59 seconds last August. 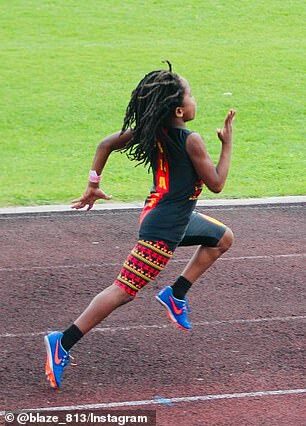 It's not known at what speeds exactly Ingram darted across the track as he wore blue and orange Nike sneakers and a kit featuring the flame of a fire, in a nod to his nickname, but the child clearly outdid his peers. Despite being a social media influencer and fitness model, Ingram has shown he's talented academically too. 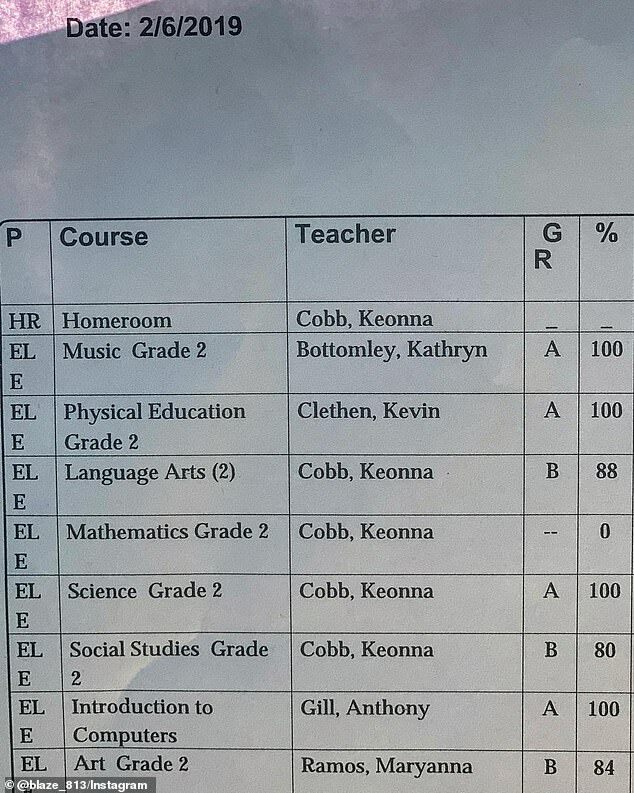 'Work hard in class and on the field,' an Instagram image of his February report card is captioned. With his father an American football coach who introduced him to NFL stars Matt Jones, Tarik Cohen and De'Anthony Thomas, it no wonder Blaze was able to dart between members of the opposing team as a six-year-old at the time who was only 3-foot-11 and weighed 48 pounds. 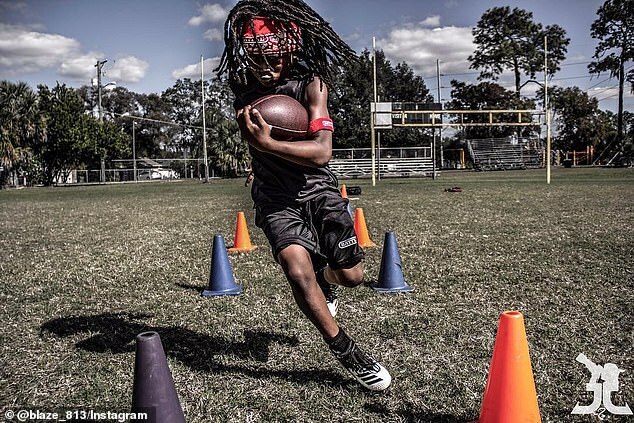 But his father Rudolph Ingram Senior aka Coach Kool has drilled it in that only his hard work has got him where he is today as an all-round great running back and safety in the Tampa Bay Ravens Youth team class of 2028. But his coach Jimmy Watson told the publication the budding Florida Gators player can constructively criticize his peers too. Using his track talent to help his football and vice versa, it was something that caught the eye of basketball player LeBron James last summer. Since then the six-pack boasting child has had hundreds of thousands of people around the world watching his moves. He even has a fan in former NFL star Devin Hester, who he was pictured with recently. Blaze – who has had incredibly toned abs since he was five - even has a younger brother on the come up. But at only four years old, his sibling isn't as skilled just yet. Dubbed Mr Wrong Way, the tiny football player shot into the spotlight last October for mistakenly running with the ball in the opposite direction but he managed to turn it around and score touchdowns in the game. At his first ever track meet race this past weekend the little boy was slightly distracted by all the attention and came in fifth out of pint-sized six sprinters. Not one to take himself too seriously, commenters on his social media account - which has more than 8,000 followers - noted how he would look directly into the stands where the camera was placed while legging it across the track.